We sell the #39 clear gloss resin in easy to pour plastic jugs. When you order 1 gallon it will come as a half gallon of resin and a half gallon of hardener. 2 or more gallons will be packaged in gallon plastic jugs. Free from "sweat out" or exudation. 100% solids - contains no solvents or volatiles. Tough, resilient coating with negligible shrinkage. Can be pigmented any color. Strong adhesion to wood, metal, concrete, fiberglass, foam, etc. Coating over Styrofoam will not dissolve Styrofoam. USES: High build coating for bars, tabletops, decorative panels, coat Styrofoam, etc. MIXING RATIO: Mix equal parts by volume of Part 1 Resin and Part 2 Hardener. Higher temperatures shorten pot life. Thin film set - 4 hours @ 72°f. Surface should be clean, dry and sanded. Apply in two coats. The first coat is a thin sealer coat to prevent any air from coming from the wood and causing bubbles. This coat is usually 1 millimeter (.04 inches) thick. The second coat is the finish coat. It should be applied thick enough to produce a smooth surface. This should take approximately 3 millimeters (.12 inches) of epoxy. Air bubbles can come from a porous surface. They come up from tiny holes in the surface after the epoxy is poured. The solution is to apply a thin coat of 39 on the surface to seal it. After the coat dries, proceed with the rest of the application process. Air bubbles are created in the epoxy liquid when the two parts are mixed together. These bubbles appear immediately in the surface after it is poured. The solution is to heat the surface with a propane torch moved over the surface from a distance of about (12 inches). The heat will thin the epoxy surface and release the bubbles. It can also come from pouring the epoxy too thick in one pour. If the epoxy is poured too thick, it will harden before all of the air can come to the surface and escape. Usually it is only necessary to pour the epoxy 2 or 3 millimeters (.08 or .12 inches) thick to achieve a smooth surface. If a thicker coat is required, do it in several thin pours rather than one thick pour. 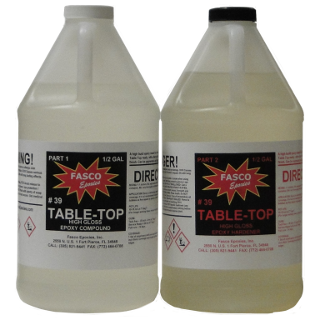 All room temperature cure tabletop epoxies are modified by heat; some as low as 43° C. (110° F). If 39 is correctly mixed and allowed to cure for two weeks, the surface should be resistant to heat modification, such as hot coffee cups, at temperatures up to 54°C (130°F). THE EPOXY MUST BE MIXED CORRECTLY. If it is not thoroughly mixed, or if improper proportions of Parts 1 and 2 are used, it will lower the heat distortion temperature. Rings in the table surface may be repaired by fine sanding and then buffing with a fine rubbing compound and then a final polish. Polishing pad speeds should not exceed 1750 rpm. It is important to store 39 Gloss Resin & Hardener at a temperature of 25°C (77°F) or higher. Lower temperatures make the resin too thick and difficult to remove air bubbles. The drying is also retarded at low temperatures. If the resin has been stored at low temperatures, allow it to warm to at least 25°C (77°F) before application. High temperatures will make the resin thinner, easier to remove air bubbles, and make the resin dry faster.